Effective business requires effective IT. And effective IT is more than just the sum of all services delivered by individual applications and infrastructure components; effective business processes rely on a set of applications that must work in unison. This is the ‘business process chain’. 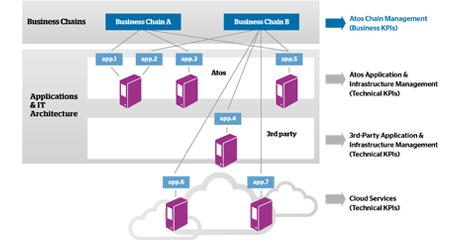 The quality of a business process chain is dependent on ‘the weakest link’. This means that managing applications individually is not enough to guarantee quality of service for the entire business process chain. This is why I think end-to-end, focusing on the whole business process chain, when it executes Application Management rather than focusing solely on individual applications. The service delivery level will be defined by Business KPIs and supported by Process KPIs. For example: “the business process chain should be 100% available during store opening hours”. In order to determine the requirements for service availability, reliability and maintainability, one must understand the organization application landscape and infrastructure and what it is capable of delivering in relation to the required availability levels. This is achieved by collecting and analyzing availability data using an innovative solution called The Bridge. The Bridge is an automated and proactive administration, maintenance and monitoring solution run by a dedicated team for handling business-critical chains and applications. The Bridge is the ‘central hub’ of our daily operations in managing systems and databases, focusing on the health of critical business process chains, end-to-end, as well as service hot-spots and business peaks. The Bridge makes our Application Management delivery team aware of any deviation from normal operations, so we can rectify malfunctions before they impact the wider business community. It provides proactive, 24x7 monitoring of the end-to-end business processes and applications by ‘bridging’ the client’s application landscape to our strategic monitoring platform.